Desikachar was a teacher whose yoga touched students throughout the world, yet his approach always put each person at the heart of his teaching. Although from the mid-1970s he traveled widely to give seminars, the individual lesson was his vehicle for designing practices that would propel a student’s yoga and inner search. His bearing was modest, his humour put one at ease. While his teachings were rooted in ancient texts and the knowledge received from his father, the clarity of his words, often illustrated by stories from his own life, spoke to everyone’s daily experience. I had the good fortune to be introduced to Desikachar in India by a dancing friend and to experience his teachings in India and North America for over 40 years. In retracing some steps in his journey as a teacher, I hope to give a sense of the way his influence spread beyond India and how he lives on in the yoga of today. Born on June 21, 1938 in Mysore, Desikachar was the second son of T. Krishnamacharya, then yoga master at the Mysore Palace and recognized today as a key source of modern yoga. Krishnamacharya was learned in several branches of Indian philosophy and attributed his yoga knowledge to his seven years study with Sri Ramamohan Brahmachari, a yogi who lived near Mount Kailash in Tibet. As a child, Desikachar liked to say that he would often run away from his father who wanted him to practice yoga, though as a youngster he did participate in some demonstrations of yoga postures. It was only after he was educated as a civil engineer that he was drawn back to his father’s teachings. In an often repeated story Desikachar described that pivotal moment during visit to his family in Madras (now Chennai). He was astonished to see a New Zealand woman jump out of a fancy car and embrace his father, saying, “Professor, thank you, I have slept through the night for the first time in years.” Impressed that his father’s teachings could have such a powerful effect on a foreigner, Desikachar renewed his engagement with yoga. Krishnamacharya was a remarkable figure who lived more than 100 years and was the teacher of both BKS Iyengar and Patabhi Jois. Yet Desikachar was unique in staying 27 years under his father’s guidance, from 1961 to his death in 1989. Desikachar used to recount his initial blunders in teaching students what he himself practiced. Gradually, under his father’s tutelage, he learned the subtle art of adapting yoga practice to each individual. In 1964 Desikachar began teaching the revered spiritual teacher, J. Krishnamurti, whose Indian headquarters was at nearby Vasant Vihar. Through this relationship, Desikachar made his first visit outside India when he was invited to European yoga conferences in Switzerland in the early 1970s. During this time a number of Americans studied with Krishnamacharya in Madras, including the American Consul General, Albert Franklin, who directed Mary Louise Skelton to him in 1969. By 1974 Desikachar took over his father’s Western students when Krishnamacharya abruptly announced that he would stop seeing them. Mary Lou was one of these. Soon afterwards she and her music professor husband, William Skelton, invited Desikachar to teach his first American seminar in January 1976 at Colgate University in Upstate New York. From this came the book, Religiousness in Yoga (1980), edited by Mary Louise Skelton, which formed the basis for the widely read book, The Heart of Yoga (1995). One of the students in this course was Gary Kraftsow, now a senior American teacher in the lineage, who has trained many teachers in North America. Belgian Claude Marechal, also began his studies with Desikachar in 1969 and within two years started to train yoga teachers throughout Europe. Claude founded the French language journal, Viniyoga, in 1983, which became an authoritative resource for all aspects of the tradition both philosophical and practical. Claude’s contribution to yoga in Canada has been immense in the province of Quebec. For over 30 years he has trained teachers there, offering Formation and Post Formation, as well as seminars on various themes and texts, and a four-year program in yoga cikitsa, a therapeutic approach of yoga. My own studies with Desikachar began early in 1974, when I spent eight months in India studying dance and yoga, following in the footsteps of Canadian Dolphi (George) Wertenbaker who had become Desikachar’s student 1970. Over the years, I have made eight trips to India to study privately with Desikachar and have attended many seminars in North America and Europe since the late 80s. These are just a few of Desikachar’s long time students who have contributed to the transmission of his teachings in the West. There are others from many corners of the world, but not huge numbers because his teaching was based on relationship and the transmission of appropriate teachings in a one-on-one setting. In India in 1976, Desikachar and fellow student of Krishnamacharya, A.G. Mohan, founded the Krishnamacharya Yoga Mandiram, a not-for profit institute to honour their teacher. Forty years later, the KYM continues this legacy of teaching in Chennai with therapy consultations, international seminars and research. Over the years, many westerners have traveled to India take their courses. In the mid 1980s, with the popularity of yoga on the rise in the Western world, it appeared that Desikachar’s approach to yoga was not as widely recognized as it deserved to be. So Desikachar asked a group of his North American students to develop an organization that would contribute to the visibility and propagation of his father’s teaching. Viniyoga America was founded in 1986 by about a dozen students who gathered with Desikachar at Colgate University. This group circulated an excellent newsletter, launched a teacher training program in 1988 and organized eight seminars with Desikachar in the US during its four years of existence. However, the organization was short-lived; Desikachar changed his mind and asked his students to give up this initiative to centralize control of the teachings. Instead he encouraged them to develop their own programs for their students, under his guidance. His reasons were rooted in his perception that the organization itself was sapping time and energy from the practice and transmission of yoga. While still seeing Desikachar, I turned to Mary Lou Skelton as mentor until her death in 1995. Her senior students, Martine Burat and Kerry Koen continued her program and brought it to completion, collaborating with Sonia Nelson, long time Desikachar student and Vedic chanter par excellence. 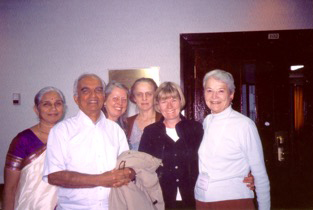 Desikachar continued to be invited to North America, memorably for a seminar on “Relationship” at Colgate in 1997 in conjunction with a beautiful ritual celebration marking Krishnamacharya’s 108th birthday, which was organized by Bill Skelton. But there seemed to be a shift coming. In October 1999 Desikachar led a seminar in Europe which honoured three senior teachers there: Claude Marechal, Paul Harvey and Bernard Bouanchaud. The following June, he animated another gathering in California, “A Vision for the Future,” which honoured Margaret and Martin Pierce, Sonia Nelson and Gary Kraftsow. It seemed that he was passing the torch of the tradition to his senior Western students, in their own countries. Until that time attendance at his American seminars was generally limited to his immediate students and their students. From this point on, his guest appearances were much larger, often sponsored by large American organizations such as the Omega Institute and The Yoga Journal. Another milestone was the 25th anniversary of the KYM seminar in 2001 in Chennai, which I was privileged to attend along with others from around the world. That September I hosted Desikachar on his first visit to Canada, where he gave an open lecture “The Heart of Yoga,” taught a yoga sutra class and led my students in practice at Hart House at the University of Toronto. From that time onwards, Desikachar began traveling with his family, sometimes teaching with the assistance of his son, Kausthub. They undertook a world tour with his wife, Menaka, and daughter, Mekhala, in 2005, which included a well-attended seminar on pranayama in Montreal in 2005. 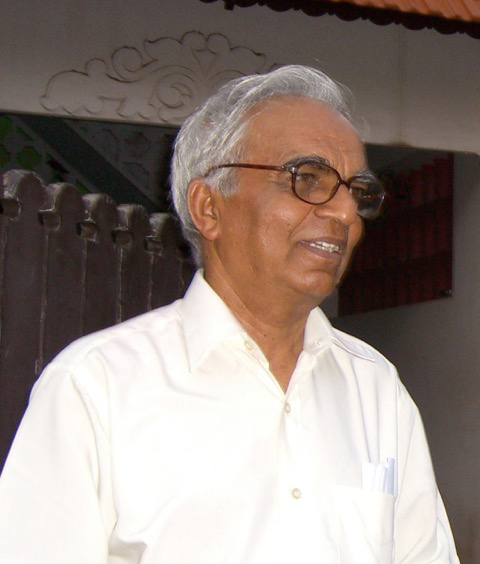 In 2006 I took a group of Canadian teachers and students to study with Desikachar at his home in Chennai. Over two weeks, he gave us a remarkable experience of yoga – practice, chant, theory and discussion – touching each person in a most profound way. Afterwards I was grateful, yet saddened, when he said this was likely the last foreign group he would receive for those full days of immersive instruction. Yet shortly afterwards he traveled back to Toronto to offer a one week seminar on Yoga Therapy with the assistance of his son, Kausthub. 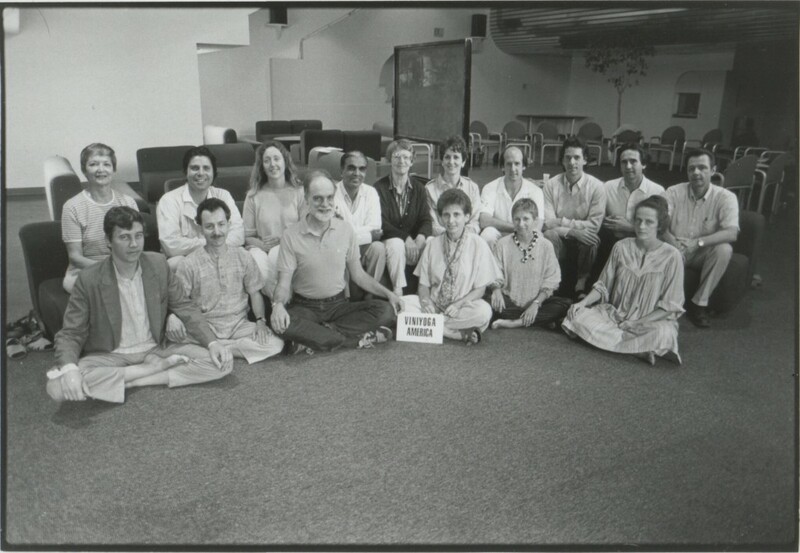 That year also marked the founding of the KHYF (Krishnamacharya Healing Yoga Foundation), an umbrella organization intended to support and direct his teachings worldwide. This seemed contradictory to his previous stance of disbanding Viniyoga America as a locus of control and within six years the organization encountered a number of difficulties and lost most of its members. In 2009, when Desikachar was still receiving individual students in India, I was fortunate to see him twice a day for two weeks. It was clear then that something was slipping in his language, though his perceptions seemed as acute as ever. By 2012 he had withdrawn from teaching altogether. Although the news of his passing, on August 8, 2016, brought a profound sense of loss, it was a comfort to know that he is at peace and that the essence of his teachings has spread throughout the world. It is hard to put into words what made Desikachar so special as a teacher: the impact of his teachings was cumulative, so deeply rooted in the tradition of his father yet continually fresh and resonant. He always placed relationship at the centre of teaching, often saying that the true test of our practice lay in our relationships with others. He taught the full breadth of yogic knowledge – asana, pranayama, meditation, chanting, study of texts – yet insisted that yoga could not be reduced to any one of these. All of these were just tools to be selected and applied in ways that would reduce a person’s suffering. He directed us to essential meanings of yoga – to quiet the mind, to cultivate quality in action, to bring peace – and aimed to make us independent through a personal practice that would bring us, step-by-step, to the heart of yoga. Rosemary Jeanes Antze teaches in Desikachar’s lineage in Toronto with Yoga from the Inside and has been a regular guest teacher for the YAA since 2003. Beautiful review of the ways in which Desikachar’s teaching and mentoring have brought that approach to yoga to us as Rosemary’s students and to so many others. So important to have this written record on the occasion of celebrating TKV Desikachar and his yoga legacy. Your article and this outline of Desikachar’s life and teaching are wonderful history. They also provide insight into the great ongoing lineage that a personal practice can participate in.